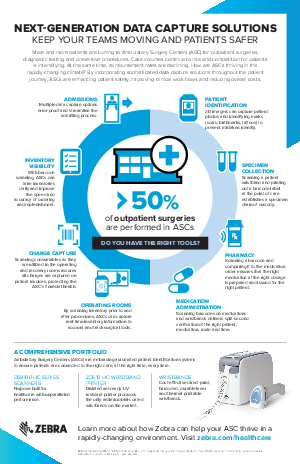 More and more patients are turning to Ambulatory Surgery Centers (ASC) for outpatient surgeries, diagnostic testing and preventive procedures. Case volumes continue to rise and competition for patients is intensifying. At the same time, reimbursement rates are declining. How are ASCs thriving in this rapidly-changing climate? By incorporating sophisticated data capture solutions throughout the patient journey, ASCs are enhancing patient safety, improving clinical work flows and reducing overall costs.